RINGMAT DAMPERS represent a new approach to vibration absorption in loudspeaker and equipment cabinets. They are used on top of the loudspeakers and equipment; so there is no need to open up anything. All aspects of sound reproduction are noticeably improved, especially the timing of the music. Ringmat Dampers are complex layers of materials designed to absorb vibrations in loudspeaker and equipment cabinets. The vibrational energy is then dispersed into the air. The construction of the Dampers is similar to that used for Ringmat Feet, but with important differences as they are used on top rather than underneath speakers and equipment. 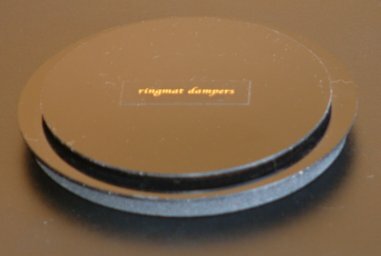 As with Ringmat Feet, Ringmat Dampers work in much the same way as Ringmats. Initially, identify the corner bearing the least weight of the loudspeaker or equipment housing concerned. As a general rule with loudspeakers, most of the weight is at the front and evenly spread left and right, so use the Damper on top of the speaker in the rear right hand quarter. With equipment, where the weight is at the back, it is generally best to use the Damper in the front right hand quarter, and in the back left hand quarter if the weight is at the front. The weight distribution can be ascertained more accurately by holding the speaker or equipment half way between front and back and see which way the weight inside pulls the speaker or equipment – to the back or to the front. Then hold them half way between left and right and again see which way the weight inside pulls the speaker or equipment – to the left or to the right. Keeping the Damper within the lightest quarter, place the outside edge of the Damper against an imaginary line half way between the two longest sides, with the centre of the Damper half way between the centre point on the longest side and the end of the loudspeaker or equipment housing adjoining the lightest quarter. Then, whilst listening to the sound from your best sounding recording at its most rhythmical, move the Damper around a little to see if an even better sounding position for the Damper can be found. change in loudspeaker placement may be necessary to realign timing whenever one of our products is introduced into a sound reproduction system. This is not unique to our products and a similar adjustment may be required when introducing other manufacturers’ products. Therefore, check the position of each speaker in relation to a rear wall, the distance each speaker is from the other and the extent to which they are each “toed-in” (to tighten imagery and adjust relationships in distance to rear and side walls). Depending upon the accuracy of the system, an adjustment of 3 to 6mm either way may be all that is needed, though sometimes more is required. Depending upon the ease with which a speaker can be moved and the manner in which it is supported, it may be possible to ascertain the correct position simply by listening to each speaker in turn whilst “leaning” or “swivelling” it in each direction. Concentrate on changes in the timing, clarity and transparency of the sound as this is done. Do NOT attempt this if the speaker is not suitably under control. Ensure it cannot topple, cause damage to itself or to its supports and that there is no risk to cable connections. In the event that no improvement in the sound can be perceived from using the Damper, this is likely to be due to the system containing a large proportion of phase errors or because the positioning of the speakers does not provide an appropriate co-incidence of direct and reflected sounds. This is all explained in the article “Trouble with Your Sound System?” on the first page of the “ADVICE” section on our website (www.ringmat.com).